"After forty years of intense research for such materials, nothing has come close to silicon—except an exciting class of materials known as halide perovskites," said Asbury. "Halide perovskites seem to have a unique tolerance for imperfections in their structures that allow them to efficiently convert sunlight into electricity when other materials with similar imperfections do not." The researchers determined that halide perovskites have a unique ability to maintain their crystalline structure even while the atoms in their crystals undergo unusually large-scale vibrational motion. All materials experience vibrational motion of their atoms, which is typically suppressed by making the materials' crystals very hard—like silicon—so that their atoms are rigidly held in place. 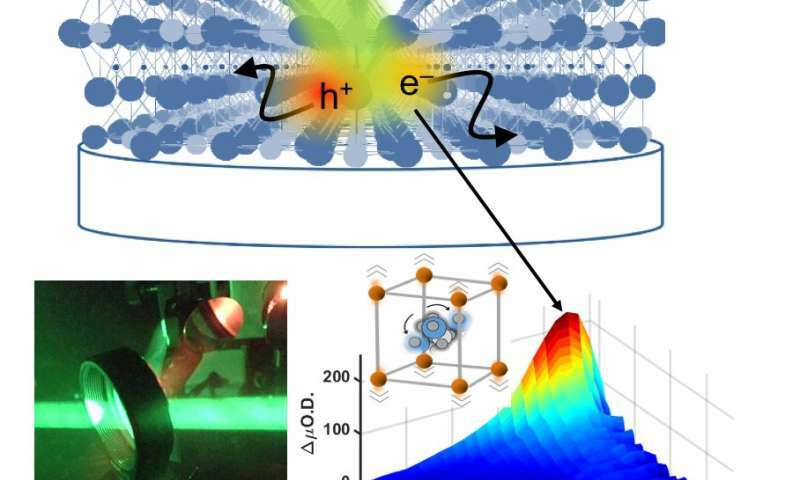 But, according to the current study, halide perovskites are very soft, which allows their atoms to move around and contributes to their remarkable efficiency.